Reset Firefox browser if your browser is faced with any malicious plugin or other concerns. The best. To restore Firefox to original settings is to reset Firefox browser. Firefox browser offers a convenient way to reset Firefox browser. 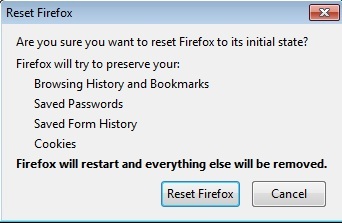 To reset Firefox browser follow the simple steps below. 2. Click on the Firefox dropdown in the top-right. 3. Navigate to the Help section of the menu and click on Troubleshooting Information. 4. 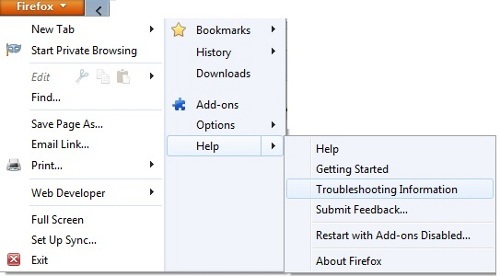 A new window will open up numerous options for troubleshooting Firefox information. 5. Since you want to reset Firefox browser, in the top-right a text banner and button will appear under Reset Firefox to its default state. Click on the button Reset Firefox to reset Firefox browser. 3. A confirmation window will popup asking you if you are sure you want to reset Firefox browser. If you want to reset Firefox browser, click Reset Firefox and Firefox will return your Firefox browser to its original state. Firefox has quickly become one of the mot advanced browser on the Internet. I has millions of users and Firefox became popular largely due to the simplicity it provide users. As an alternative to other Internet browsers, Mozilla Firefox has grown into a vibrant community of users and developers. Users can do many things with Firefox including downloading great Firefox extensions for social sharing, reading, and other utility based tasks. The plethora of Firefox extensions makes using Firefox an exciting prospect for users as Firefox keeps releasing new product versions of Mozilla Firefox Internet browser. Sometimes vulnerabilities like malicious extensions, etc. become very hard to delete and resetting Firefox browser is the best option to return to original settings. While there is an advanced tutorial you can follow to remove plugins and other extensions you are not using, a simple reset of the Firefox browser will ensure it takes it back to the original Firefox default settings. Reset Firefox browser if you are having trouble removing a malicious extension or if you just want to restore Firefox back to “factory” settings then follow the above steps to reset Firefox browser.